I’m not sure why but sometimes all I want for dinner – more than a flavour, more than a meal, more than food itself – is a big bowl of nutrition. In the summer this invariably means a salad full of amazing summer leaves. At other times of the year it’s more robust leaves and beans or pulses of one kind or another. And so this was the reason behind a new combination of the two for last night’s dinner. 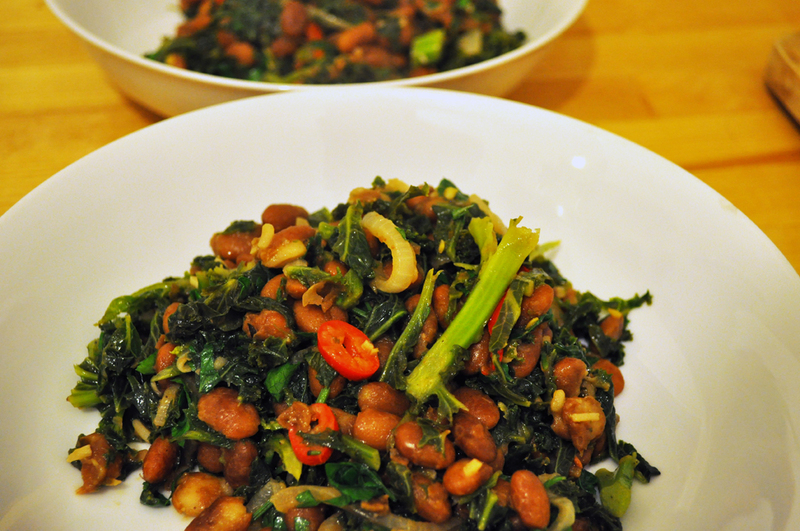 We occasionally cook pinto beans or borlotti benas, and frequently cook kale. But the two together? Well, they work a treat. I soaked the beans in water during the afternoon then simmered them in some stock until soft (very important! ), then refreshed them under the tap. Meanwhile I steamed a bag of curly kale for 6 minutes, ran it under the cold water to stop it cooking and set aside. Next you need to finely slice an onion and fry it in olive oil until softened and golden, add three cloves of chopped garlic and fry for a further minute or two, then add chopped fresh red chilli (to your own taste). Add the pinto beans, stir well, add a sprig of rosemary, chopped finely, and a few leaves of oregano, again finely chopped. Then add a glug of white wine vinegar. Simmer for two minutes, season with salt and pepper, add 3 tbsps of olive oil and the kale, stir in, then add a bunch of flat leaf parsley. Stir in again, leave for a minute, then serve. After a Saturday night away at a friend’s birthday and a Sunday cruelly taken up with work, we wanted something for our evening meal that wasn’t too time-consuming in the kitchen. We had a bag of purple sprouting broccoli in the fridge and were originally going to make some Asian-inspired greens until we opted for some oven-baked comfort food. Broccoli was steamed, a sliced onion was wilted in a frying and and a bunch of spring/salad onions were chopped. All this was combined and dusted with some chickpea flour then mixed together roughly. (The flour? It helps to thicken the cheesy sauce. Chickpea flour? No wheat.) Then I poured over 300g of creme fraiche and 250g grated cheddar cheese, mixed it all up in a casserole and stuck it in the oven 200 degrees. After 20 minutes I took it out, grated over some parmesan and returned to the oven for 5 minutes. It came out golden and piping hot. 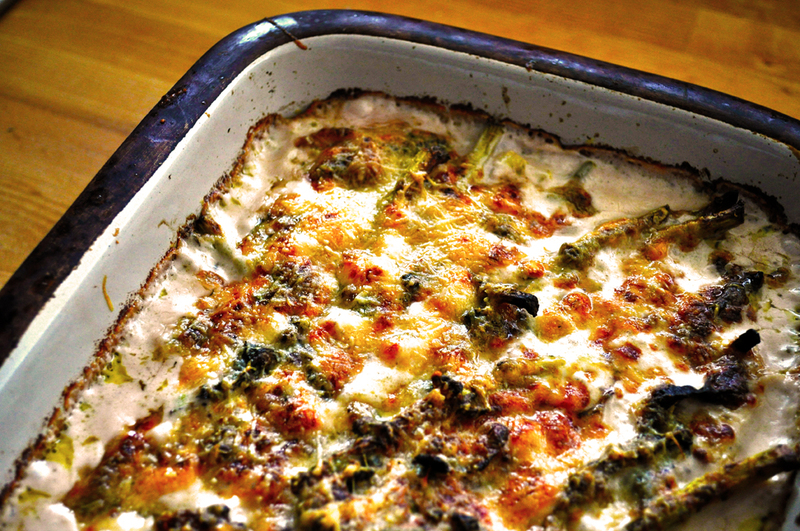 Cheesy greens for a Sunday supper! Nothing beats eggs for brunch and this was a true Saturday morning winner. 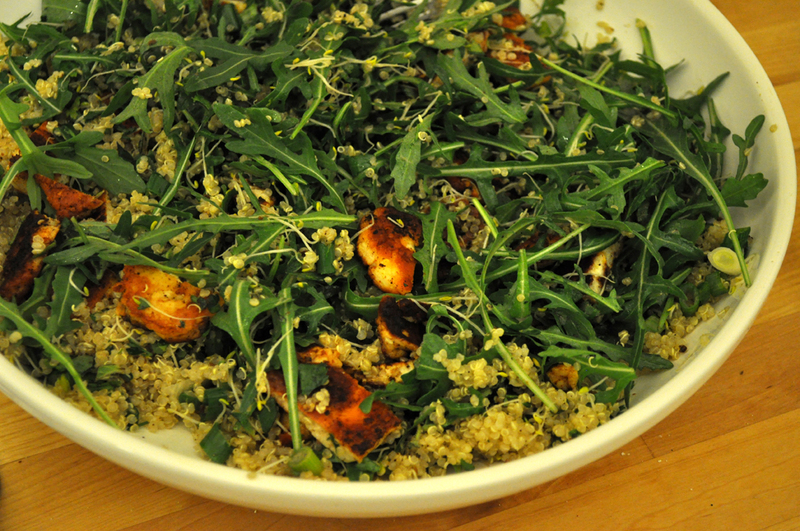 Recipe from Hugh Fearnley-Whittingstall here. 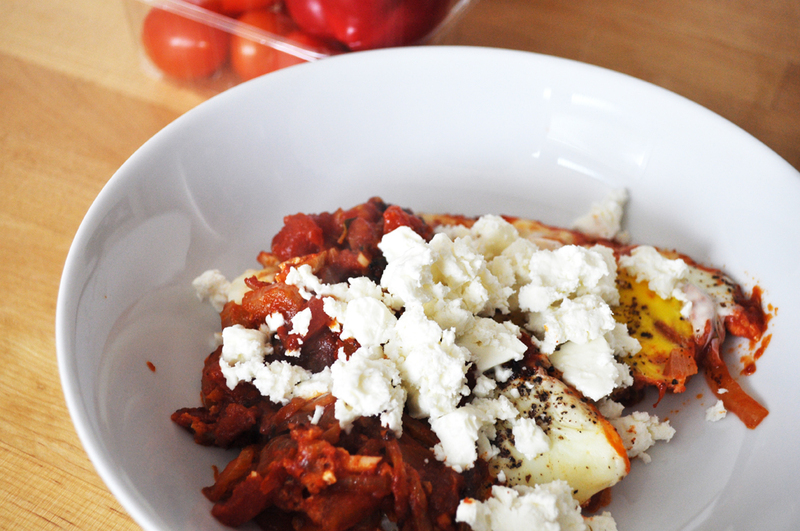 We often make a dish of lentils that we crumble feta cheese over. I think we invented the recipe ourselves and it’s a warming, hearty dish for an autumn or winter evening meal. This is a variation. 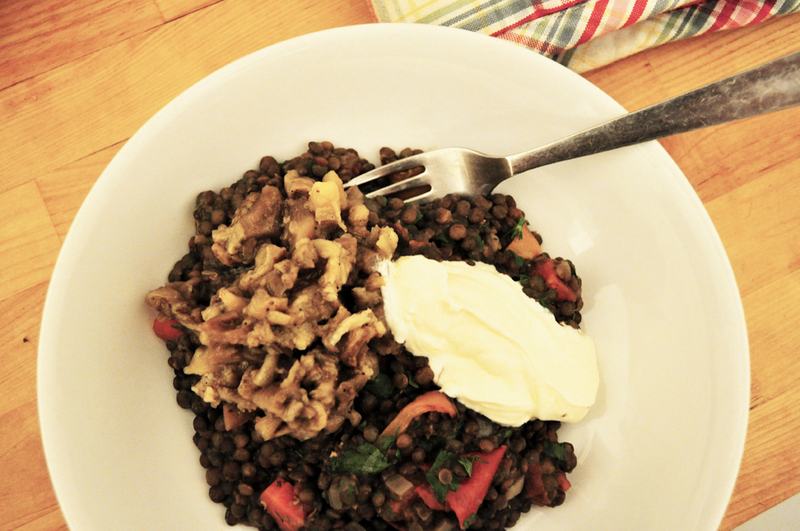 Puy lentils love some onion and pepper running through them – ooh, and a carrot too. Here we cooked the lentils with a finely chopped onion and chopped carrot, then added some roasted pepper and tomato. For the aubergine – essentially a rough baba ghanoush or Lebanese/Egyptian moutabel – we roasted the aubergine, scooped out the soft flesh, added olive oil, crushed garlic and seasoning, and mashed. To serve, we added a splash of red wine vinegar to the lentils, some chopped parsley and dill, topped with the aubergine and a dollop of Greek yoghurt. Lovely. Pizza Express is currently running a pretty good value ‘Any pizza for £5.95 offer’. To take advantage you need to sign up for a code. Simple. Often their offers limit the choice of meal options – not always a good thing for vegetarians – but with this one you can choose any pizza from the menu. Get your promotional code here. 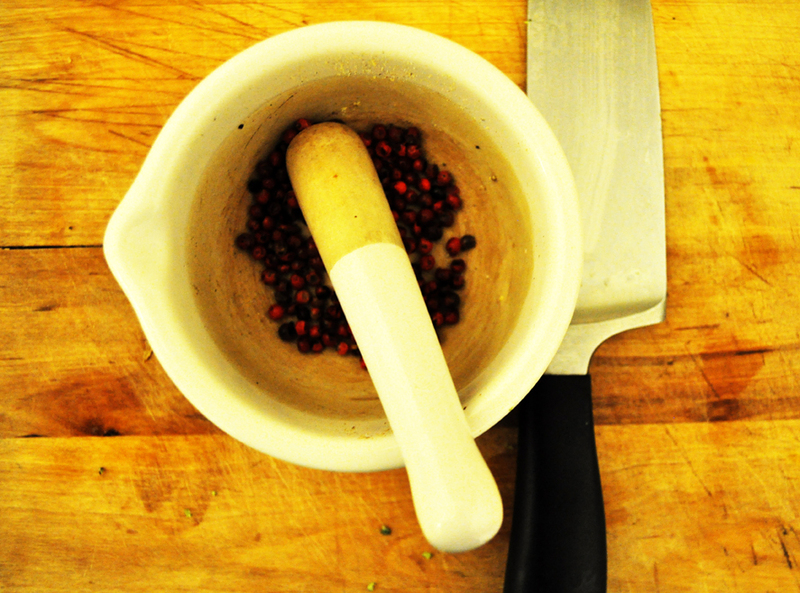 I know, that’s a mortar and pestle above, not a picture of last night’s dinner. However, there’s a good pic of the food, along with the recipe, here. Sometimes we make creamy curries with coconut milk or yoghurt, sometimes tomatoey ones with a hint of sweet and sour, and sometimes this type, which uses a spicing mix that, if it were a wine, I’d describe as ‘dry’. There’s lots of chilli, then ground turmeric, ground cumin, ground coriander seed, yellow mustard seed, grated fresh ginger, cardomom and rather a lot of fennel seeds. You’ll notice I don’t like to give accurate measurements for spices very often. Why? Well, I think it’s a question of taste. However, I never trust those recipes that state that 1/4 or 1/2 a teaspoon of a spice is enough. In my experience, it really isn’t. As a starting point I’d suggest about a good teaspoon for each of the above, then experiment. The spices get fried off with an onion and then I blend that with a little sunflower oil and a drizzle of water to get the curry sauce base. In the meantime, start to cook some red lentils in another pan. When they’re soft and saucy, add the spice mixture. You can add whatever veg you like really. I chose a tin of chickpeas, some boiled new potatoes, plus a lightly fried courgette. Carrots, cauliflower and green beans are also good. I tend to avoid aubergine with this recipe as its smoky creaminess somehow doesn’t suit. Anyway, when the veg is cooked, tip in into the pot and mix. Finally chop two cloves of garlic, place them into the bowl of a metal ladle, pour a little oil over the top and then heat the bottom of the ladle over a flame until the oil bubbles and the garlic starts to turn light gold in colour. Add to the pan, mix and serve. N.B. 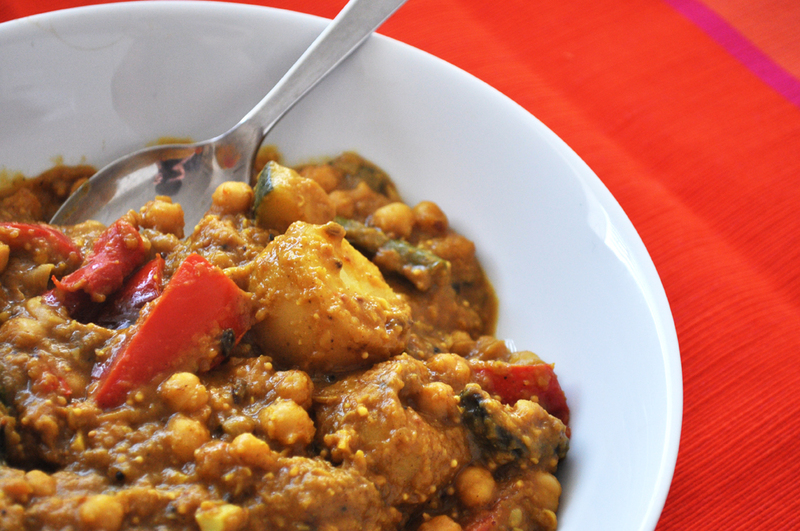 This is a curry that invariably tastes better a day later, so make enough to leave some over. A busy weekend but it didn’t stop us from cooking. We had family round on Friday and Ella suggested our Tofu with Black Bean Sauce. I find the Cauldron tofu firmer than the Blue Dragon variety in our local supermarket – it doesn’t fall apart as soon as you touch it and stays together in the pan. To fry it I literally coat the pieces in a dusting of cornflour – then straight to the pan. When golden I set it aside while I’m making the black bean sauce. Tins of black/turtle beans are fine for this and I add a splash of rice wine vinegar, some tamarind paste, a teaspoon tomato puree, sichuan peppercorns, garlic and, of course, chilli. Add a little water to the pan and then simmer for ten minutes. Add the tofu and mix in just before serving. On Saturday I was inspired by a recipe and quick as a flash made a variation on Jamie Oliver’s 30-minute cauliflower macaroni and chicory salad. (The variation? We didn’t use macaroni or breadcrumbs with the cauliflower as we’re reducing our wheat/gluten intake). I was worried the cheese sauce might not work out but, you know, it was okay. As a quick cheat on making a proper cheese sauce it wasn’t half bad. Oh and the sharp dressing (‘insane’ as chef Oliver has it) was darn good. It was a Denis Cotter veg-fest in the Guardian today, as the vegetarian chef from Cork City delivered three recipes for St Patrick’s Day. Each is a vegetarian dish using some classic Irish ingredients. First up is a braised turnip galette of mushrooms and chestnuts (here), then there is a cabbage timbale with tomato sauce and parsnip gnocchi (here) and finally, and the one I think I’ll make first out of the three, blue cheese potato cakes with bean and cider stew (here). There’s always a fair amount of work to do in Cotter’s recipes – he’s not a one-pot cook – but it’s the combination of elements in his cooking that sets him apart. So you know that with the potato cakes it won’t just be the way the blue cheese and cider hang together well, it will be the addition of the rosemary aioli that lifts it to unexpected places. With the galette it will be the red wine sauce that does the trick and with the cabbage timbale it will be the tomato and thyme sauce – or perhaps the fact that the gnocchi is made with parsnip, not potato. It’s the addition of third element on the plate that makes the difference.